Take in the incredible view on the sun deck. The hot tub is a welcome respite after adventures. Make memories around the fire pit. Two gas fireplaces are sure to delight. From its mountainside perch, the Sun Eagle Lodge gazes out towards the secluded splendor of the Smoky Mountains. Peering out over the powder white sea of clouds, the warmth of the sun will touch your face and bring a joyful smile. It’s not only a beautiful view. It’s a beautiful life! Come live it with us at the Sun Eagle Lodge. 3 Bedrooms & 3 Baths: The downstairs bedroom has a king-size bed, gas fireplace, satellite TV, deck access to the hot tub and second TV just for the Wii; the private bath has double sinks and a jetted bath tub. A second bedroom in the loft has a king-size bed and private full bath with a tub and shower combination. The third bedroom is on the main floor and has a queen-size bed and bath across the hall with a tub and shower combination. The open kitchen features granite countertops with seats to chat in the morning at the island bar. The Sun Eagle interior was designed for comfort and style but nothing can compare to the pure beauty of the nature that surrounds you outside. From our upper deck you can spend the day grilling or basking in the sun on a lounge chair. When you’re ready to cool off head down to the tree shaded lower deck to relax and take in the view in one of our rocking chairs. At night you and your friends can slip into the hot tub and stare up at the moonlit sky above. Outdoors enthusiasts will be in paradise! Just off your deck or out your front door you can grab a set of binoculars and catch the hundreds of species of birds or take a walk along the tree lined winding roads on Baines Mountain. Sun Eagle Lodge will help you make beautiful mountain memories. This cabin is amazing! The location is private, but I can see that it would be hard to get up there in bad weather. Luckily, we had no issues. The communication was detailed and sufficient. Arriving late yet getting in using a keypad made things so much easier since we had multiple couples staying in the cabin together. The view made it understandable to leave uncovered. Highly Recommend! They saved my anniversary trip! With 2 weeks until the trip, I was devastated. In a matter of a few hours, they had found the perfect cabin for us. They were responsive, empathetic and understanding. I have used GSCR in the past, and will only use them in the future. Mishaps happen, but how they handled it speaks volumes about their customer service. Thank you again! As we depart, a shroud of mist fills the mountain valley. The trees are a stark reminder that it is winter but in our hearts we visualize all the seasons that turn the landscape into a myriad of colors and peaceful moods. We can hope to return someday and bask in the serenity of the Sun Eagle but for now, we are reminded that someone once said, "I go and prepare a place for you." The team was super friendly, with efficient and timely communication. We felt prepared for everything this weekend. We had a great time. The cabin was spacious and had everything you needed for a great weekend away! The Sun Eagle Lodge was absolutely perfect. Amazing views from both decks. Large, open living room and a well equipped kitchen. There's a hot tub on the lower deck with direct access from the master suite. The master suite is like it's own separate cabin, isolated on the lower level by a long stairway and it's own full bath, semi-private deck, and fireplace. Did I mention the hot tub on the lower deck?? Stunning. We were so thankful to have a beautiful place for our college friend group to get together. We all graduated from WCU between 2014 -2015 and have since moved all over. It is nice to be able to spend time with each other - including 2 new additions to the family! We all consider the mountains are home and this breathtaking view was perfect. The view was spectacular. The cabin was very clean and well taken care of. We had a wonderful stay. Everyone was very friendly and helpful when we had questions. They were courteous and prompt. The cabin was beautiful. It was in a perfect location with easy access to Bryson City. The views from the decks were amazing. We ate breakfast every morning on the deck taking in the view. The hot tub was great for relaxing at night. All in all, our family of 4 had a great stay. We truly enjoyed our stay. We loved the cleanliness, the views and the games! North Carolina has been wonderful. We will be back! We had a wonderful stay! The cabin is beautiful!! Excellent customer service from GSCR!! The cabin is a lovely property, very clean and properly stocked. The view was beautiful, even through the rain. Beautiful Clean cabin with an excellent view. Everything was perfect. The Rao family loved the Mother's Day weekend stay. The attention to detail in the cabin is amazing - the kitchen set up, the games, the CD's, the extras in the rooms. 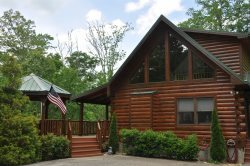 "It is a very well maintained cabin. Lovely view of the mountains made for a very unique experience of staying here. Coffee on the patio and the Hot Tub were icing on the cake. The stay was beyond anything we ever imagined. Great cabin. Each room has it's own bathroom. Very clean. Hubby loved the Jacuzzi tub. We love this place!! We are looking forward to coming back. Remember, nature is beauty! We had a lovely time here in Sun Eagle Lodge. WE enjoyed hiking in the surrounding areas, like Fontana Dam and Deep Creek Loop! We loved the Hot Tub too! Our stay exceeded our expectations. The cabin was beautiful, had everything we needed and was very clean. We can't wait to go back! We loved the hot tub and the views! We went hiking and visited downtown. We came from NC, NY and Alaska. We enjoyed the view and comfort of this beautiful cabin. We definitelyy recommend the Smoky Mountain Railroad and the Biltmore with all the Christmas lights was amazing! Thank you for having us, we will be back! We came for family vacation, which brought our college kids together with us. IT WAS WONDERFUL! The View is amazing. We will return for sure! We even had a light dusting of snow on Christmas Eve, which made it even more magical! Every detail was thought out! Loved reading others comments and it was helpful to have brochures available. They even called to make sure we made it in safely! Cabin was amazing! Thanks for being so accommodating. We will be back!! We came to enjoy the Polar Express. Loved the cabin. Very cozy. Kids loved it!